"...It Was Time For a Little Improvement." - Thin stamped overlay - A polymer modified concrete based coating that is applied about 1/4" thick to an existing concrete surface and stamped to resemble that of conventional full depth stamped concrete. - Splatter texture overlay - A polymer modified concrete based coating that is sprayed on with a drywall type hopper gun to provide a decorative and skid resistant decorative concrete coating. - Knockdown overlay - Like the splatter texture overlay, this is a polymer modified concrete based coating that is sprayed on with a drywall type hopper gun and flattened with a trowel to provide a decorative and skid resistant decorative concrete coating. - MICRO-FINISH - An extremely smooth polymer modified concrete coating product used for decorative concrete applications on interior concrete surfaces where a custom and seamless but decorative concrete floor is desired. MICRO-FINISH can be colored with an acid stain product to give it the look of aged colored concrete. - Acid stain - Also known as chemical stain is a solution of chemical metallic salts in diluted hydrochloric acid and water used to create a stain solution that when comes in contact with concrete, creates a color effect. acid stain is typically available in colors ranging from red to tan to black to gold to brown to blue and even green. 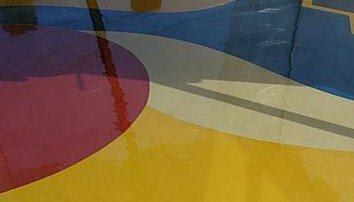 Perhaps the only disadvantages of acid stain is that the color cannot always be predicted because of variations in concrete substrates and that the acid stain needs to be neutralized the same as concrete must be neutralized before a decorative concrete coating is applied. - chemical stain - Also known as acid stain, is a solution of chemical metallic salts in diluted hydrochloric acid and water used to create a stain solution that when comes in contact with concrete, creates a color effect. acid stain is typically available in colors ranging from red to tan to black to gold to brown to blue and even green. Perhaps the only disadvantages of acid stain is that the color cannot always be predicted because of variations in concrete substrates and that the acid stain needs to be neutralized the same as concrete must be neutralized before a decorative concrete coating is applied. - ULTRA-STONE stain: A non-hazardous stain that is used in place of acid stain based products where good color variation is needed on concrete, decorative concrete, stamped concrete or other concrete coatings. - Decorative concrete - Concrete surfaces that have been colored or coated with acid stain, chemical stain, concrete coatings or thin concrete overlays to improve the look of plain gray concrete.